Published February 6, 2019 By Leisa Good This post may contain affiliate links. Regardless, I only recommend sites I've researched and/or used and trust. Are your friends always telling you that you should sell your crafts? Are you looking for sites that will not charge a ridiculous amount of fees? Well, then keep reading. 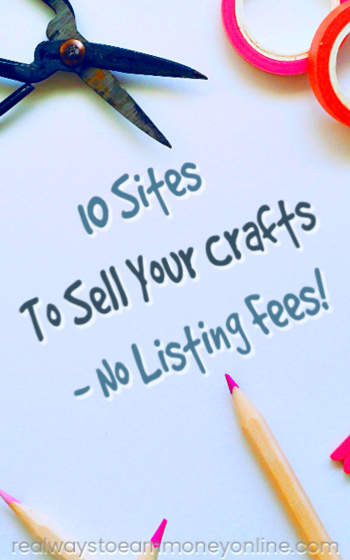 This article will help you find ten sites where you can sell your crafts without a listing fee. First of All, What Are Some of the Fees that Crafting Websites Charge? Add these fees to any percentage the site might take, plus the cost of materials and shipping supplies—this can get costly for the seller! So, What Are These 10 Sites That Do Not Charge a Listing Fee? Please understand that there are more than just ten, but this list will get you started. Aftcra – This site has no listing fees, but does take a 7% on sales. All items must be made and sold in America. Up-cycled and repurposed items are also welcome as are printed and digital goods as long as they are the work of the seller. No vintage items are allowed. Crafters will set up a shop and then after 6-months any items which have not sold will be considered expired, but may be relisted. Your online shop may add Google Analytics for tracking. Artfire – Once you sign up here, everyone is given their own online store. There are three stores to choose from: Standard, Popular, and Featured. The Popular and Featured shops do not have listing fees, and their monthly fees are $20 and $40, respectively. The Standard store does have listing fees of $.23 an item, but the monthly fee is only $4.95. This would be a good place for those sellers just starting that may not have a large inventory or just want to test market what they are selling. There is also a community for all the shops to connect with crafters from other parts of the world, and contests also are available for those who want to participate. Handmade Artists' Shop – This site has been around since 2012 and doesn't take any commissions or listing fees just a strait forward $5 a month for your own online shop. You may also post multiple images in one listing. There is a forum to ask questions as well as a blog with helpful information. All payments are made to crafters via PayPal. The really good thing about this site is that you can order two or three items each from a different seller and not have to pay separate shipping for each vendor. Sorry, there is no selling of vintage items (unless they were recrafted into something else) or mass produced items. Handmade at Amazon – See Review – This site is owned by who else but Amazon. It was started as an alternative to Etsy and eBay for those who wanted to sell handmade goods. Handmade at Amazon is free to list and no set up or monthly fees. Only 15% commission when something sells. However, in order to gain acceptance you must click on their “Request an Invitation” button on their homepage. Once invited, you will send in your information along with pictures of your crafts. Your crafts cannot be from a kit. If accepted, you will create a profile. You can also use Fulfillment by Amazon to ship your products and also you can get UPCs for your products or participate in their affiliate program. Hyena Cart – This site does not have listing fees and allows you to have your own store for $5 a month, and you are allowed to take time off from your store or close it down for a month or two with no monthly fee. You may have a shared store, your own store or Spot's Corner where you can list your unwanted manufactured items. Many of the crafts are eco-friendly such as fancy cloth diapers and/or hats made with recycled materials. Most of the items here are custom-made to order. Shop Handmade – This site is considerably smaller than some of the other craft sites; however, it does not charge fees for listing or a monthly shop fee. This alone would pave the way for a low-risk place to sell your crafts. Unlike other sites, you may also sell gently used craft supplies as well as genuine vintage items and crafting services. Shopify – This site will allow you to fill orders, perform analytics, and more all from your Smartphone. It will supply you with a full e-commerce store which takes credit cards. Fully customizable with added bandwidth as your store and business grow. There are no listing fees for any of the three plans: Shopify Plan, Advanced Shopify Plan, and Shopify Plus. The only fees are for credit card processing and the monthly fees are $29, $79, and $299 respectively. Bonanza – Bonanza has zero listing fees and zero setup costs. Bonanza has always prided itself on “anything but the usual.” They also have an affiliate program too. In 2016, Bonanza beat out eBay and Amazon for the “Best Overall” site. You may sell both brand name items, handcrafted items, and good quality used items. Bonanza will also take care of Google searches for you via their keyword experts. They even have photo cropping and many other technical tools. iCraft – Everything on this site must be handcrafted and no food items or vintage items. After the $25 registration fee, there is a $5 a month payment (for one of the cheaper plans) for unlimited product postings. Professional Plan is $10 and the Elite Plan is $15 a month with unlimited product listings. There is also a referral program for sellers. Square – This is an easy site with everything you need to set up shop. There are no fees other than a credit card processing fee for when something sells. There aren't any more fees listed than the one previously mentioned, but all advertising is up to you. You can also have gift cards made up and be listed in a directory. You may sell handmade goods, tickets, accept donations or even offer services. If you have an off-site store, you may also offer in-store pickup as well. Selling crafts online is not any different than any other online business. You will always have operational costs. The important thing to remember is to try to objectively weigh all of your options with what you can afford. Good luck to all crafters and go make money. @Shelby Williams – Wow! You sound very musical. You definitely have my prayers. There are so many things that you could do to promote your CD. Unfortunately, there is not much room in this little comment box. I would just do a simple WordPress or Wix (very easy) web site and see what happens then base my marketing on the interest shown in the CD. @Shelby Williams – Wow! Congratulations on your CD! You sound very creative. You definitely have my prayers. There is just so much that you could do to promote your own CD on your own website with its own landing pages. There’s just not enough room in this little comment box to tell you all of them, but I’d say just step out and do a simple WordPress site or even Wix (very easy) and see the interest people have in your music. Sorry, for the double post. My browser got stuck. See what I said about these little comment boxes. LOL. Hi. I’m on the worship team at a local church. I’ve worked in logistics and construction all my life and been involved in worship all my life. I’m 63 years old. I recorded a CD of original songs back in 1992, but have never had a agent or publisher. Would like to set up a website to sell this and future recordings. Guess I’m just asking for prayers and advice.